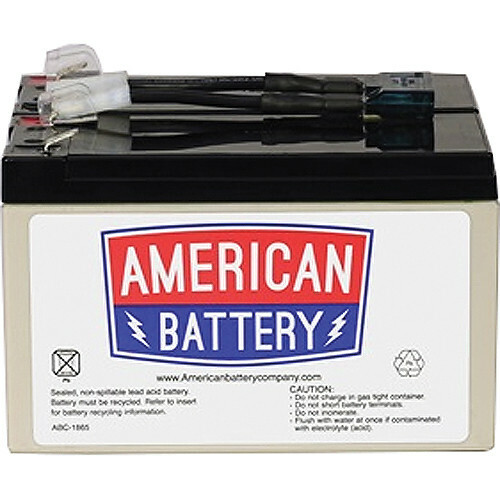 Manufactured to the same specifications as OEM batteries, the UPS Replacement Battery RBC9 from American Battery Company is a Replacement Battery Cartridge (RBC) for an Uninterruptible Power Supply (UPS). UPS devices function as backup power sources to help maximize your run time while reducing your risk of data. The RBC9 is compatible with APC UPS models SU700RM and SU700RMNET. The RBC9 consists of two sealed lead-acid batteries with cables and connectors that have a capacity of 12V and 7Ah. It arrives pre-charged and has an expected lifespan of 3-5 years. This unit is also plug and play and hot swappable, which in not only helps simplify installation, but also creates little to no network downtime during installation. Included are all required connectors, cables, fuses and metal enclosures, where applicable. This product is made in the USA. Box Dimensions (LxWxH) 8.8 x 8.2 x 6.9"